Toiletry sets were popularized by the Romans throughout their empire. They became an important part of personal attire for women, and remained popular through the Victorian Age. 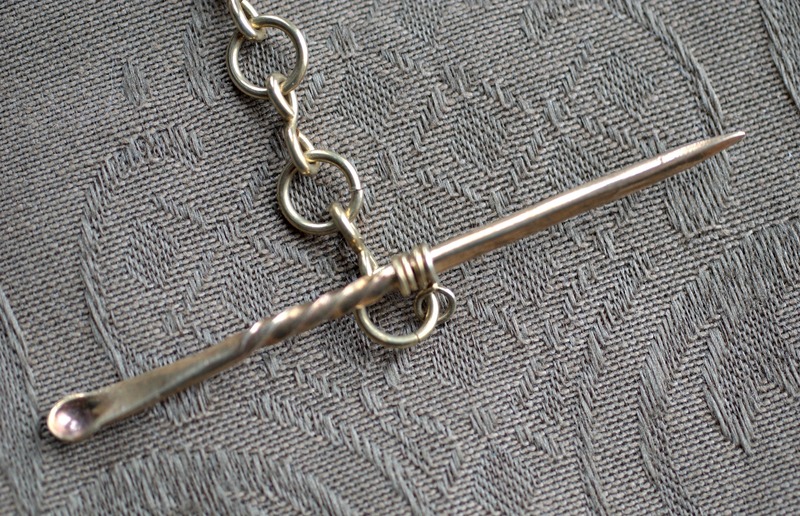 Pre-1066 women’s sets usually consisted of a pair of tweezers, an ear-spoon, and a toothpick/nail cleaner, or just an ear-spoon and a toothpick/nail cleaner. Some sets also included a small brush – possibly for the application of cosmetics. Late in the Roman Era specialized, and essentially unusable forms of the toiletry set developed that were only intended as a sign of Romanization – the Toiletry Brooch. This was basically a decorative brooch, often enameled, with a bar that had tiny representations of the various toiletry items hanging from it. Most toiletry sets were made of a copper alloy (bronze), but examples of silver and gold sets do exist. 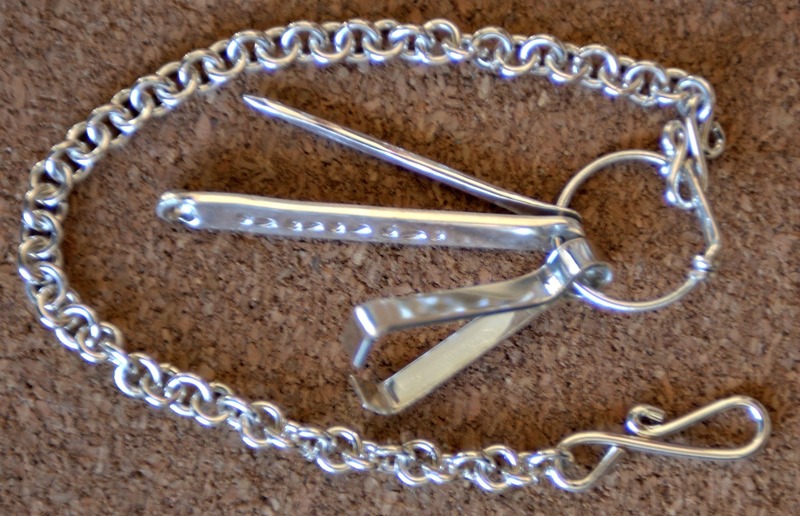 This form of silver toiletry set on a silver chain is appropriate for both Viking and Anglo-Saxon women. Men commonly carried a pair of tweezers, and sometimes an ear-spoon, in a pouch. Viking women usually hung their toiletry sets from their brooches, on a chain or string. Anglo Saxon women hung their toiletry sets from their belts. Less commonly, both groups kept their toiletry sets in a pouch, which could be suspended from a belt. Late 1500’s toiletry sets often included things like bodkins, for lacing clothing, and scissors, for sewing. They were often suspended from elaborate Chatelaines that hung from a belt. I hope that this brief summary helps you have a better understanding of the nature and origins of toiletry sets.